The H.L. Hunley, a Confederate submarine, disappeared off the waters of Charleston, S.C., on the night of Feb. 17, 1864, after sinking the USS Housatonic. It was recovered over hundred years later, and the remains were positively identified and reburied at Magnolia Cemetery in Charleston, South Carolina on April 17, 2004. THE HUNLEY crew was composed of Lieutenant George E. Dixon (Commander), Frank Collins, Joseph F. Ridgaway, James A. Wicks, Arnold Becker, Corporal C. F. Carlsen, C. Lumpkin, and Augstus Miller. Apart from the commander of the submarine, Lieutenant George E. Dixon, the identities of the volunteer crewmen of the Hunley had long remained a mystery. Douglas Owsley, a physical anthropologist working for the Smithsonian Institution's National Museum of Natural History, examined the remains and determined that four of the men were American born, while the four others were European born, based on the chemical signatures left on the men's teeth and bones by the predominant components of their diet. Four of the men had eaten plenty of maize, an American diet, while the remainder ate mostly wheat and rye, a mainly European one. By examining Civil War records and conducting DNA testing with possible relatives, forensic genealogist Linda Abrams was able to identify the remains of Dixon and the three other Americans: Frank G. Collins of Fredericksburg, Va., Joseph Ridgaway, and James A. Wicks. Identifying the European crewmen has been more problematic, but was apparently solved in late 2004. The position of the remains indicated that the men died at their stations and were not trying to escape from the sinking submarine. In Memorial Day ceremonies, the U.S. ambassador to Libya, Christopher Stevens, stood silently next to the graves of American sailors in a tiny walled cemetery overlooking Tripoli harbor. Flowers and small U.S. flags decorated aboveground stone crypts where the seamen were buried in the shade of olive trees. More than 200 years ago, Navy Master Commandant Richard Somers and a dozen volunteer crewmen sailed an explosives-laden Intrepid toward anchored pirate ships in the harbor. The Intrepid blew up before the mission's completion, killing all aboard. Somers, who was educated in Philadelphia, and fellow officers Henry Wadsworth and Joseph Israel and other crew members were recovered and buried. Following Stevens' death Sept. 11 in an attack by Islamist militants on the U.S. consulate in Benghazi and the recent desecration of the graves of dozens of British Commonwealth soldiers at Tobruk, local efforts to repatriate the sailors have been redoubled. Since the 1804 deaths, generations of the Somers family, along with state and federal legislators and officials, have worked, without success, to gain Libya's and the Navy's help to return the remains. They've been joined by many others, including Somers Point Mayor Jack Glasser; naval historian and author Chipp Reid, who wrote the just-released book Intrepid Sailors; and historian and author William E. Kelly Jr., who wrote a history of Somers Point called Three Hundred Years at the Point. "I would like to see [the Intrepid's crew] shown some respect," said Michael Somers, 40, a Berlin resident and second cousin of Richard Somers seven times removed. "The soldiers of other wars are brought home." "Why not these?" asked Somers, a paramedic who grew up at Somers Point. "With so much instability there, we don't know what will happen next and whether we will ever be able to reclaim them." The remains "should be brought to Somers Point for burial," said Reid, who addressed members of the staffs of the House and Senate Armed Services Committees on Friday on the proposed recovery. "This can't be that tough. "Our fear is that their graves will be desecrated" like those of 35 World War II soldiers from Britain, Australia, New Zealand, and South Africa who were buried at Tobruk, said Reid, 48, of Annapolis, Md. The Old Protestant Cemetery, where the Intrepid crew is buried, "is small and its only security is a padlock on the front gate," he said. The sailors "should be brought back quietly, quickly, and without fanfare," added Kelly, who sent a copy of his book and a letter detailing the proposed recovery effort to Stevens a week before his death. Kelly believes five crew members are buried at the cemetery while eight others are under what is now a parking lot at Green Square, where the followers of the late dictator Moammar Gadhafi once held demonstrations. Commandant Somers, who is believed to be at the walled cemetery, was born in Somers Point, named after the naval hero's great-grandfather. Residents there hold a Richard Somers Day celebration every September. "Maybe if we wait a week, the Islamists will go to the cemetery and it will be too late," said Kelly, 60, of Browns Mills. "We don't want to call too much attention to this because the graves could be desecrated." Gadhafi's killing in October 2011 gave fresh impetus to the effort to bring the crew home. Maybe the country's new leadership would make the transfer easier if the Navy got on board with the project, supporters thought. They were further encouraged by the passage of the 2012 National Defense Authorization Act, which required the completion of a study to determine the feasibility of returning the remains. That study, released this fall, focused on the problems of recovering the sailors, however, and did not recommend the project. It estimated the cost of recovery and identifying the remains to be about $770,000. Proponents of the repatriation estimate it could be done for under $50,000. Somers, Wadsworth, and Israel are believed to have separate coffins, each with markers that say, "Here lies an American sailor who gave his life in the explosion of the United States Ship Intrepid in Tripoli Harbour. . . . "
The rest of the remains were interred on the beach and later - when unearthed during a highway project - were moved to the walled graveyard, Reid said. The walls were crumbling in recent years until restoration shortly before a visit by U.S. Defense Secretary Leon Panetta in December. Kelly said Panetta and the secretary of the Navy do not appear "to have the time or inclination to deal with this issue at the moment, yet it is one that needs to be addressed and acted on as soon as possible." U.S. Rep. Frank LoBiondo (R, N.J.), who has supported the effort, met with Navy officials in recent months before the ambassador's death, but a spokesman said he has larger issues to deal with now. While he "is committed to bringing the fallen commandos home, current efforts are put on indefinite hold due to the situation on the ground in Libya," said the spokesman, Jason Galanes. The recovery effort, though, continues to stir residents across Somers Point. Several of them work with groups to bring the sailors back to their community. "We have selfish reasons," said Greg Sykora, 48. "We want to bring our son home. . . .
"These men are heroes," he said. "Why would you not want to repatriate them?" The Department of Defense study on the feasibility of repatriation of the remains of American Navy personnel in Tripoli, as ordered by the 2012 Defense Authorization Act, was due in October, but has yet to be completed and released, most likely because of the assassination of the American Ambassador to Libya Chris Stevens. The September 11th murder of the Ambassador in Benghazi by radical Islamist and al Qaeda associates has been followed by the replacement of Gen. Ham at Africa Command, the relief of a fleet admiral at sea, the demotion of another general and resignation of the director of the CIA in a growing scandal in Washington that has put the military-intelligence administration in a state of turmoil. The office of Secretary of Defense and Secretary of Navy do not have the time or inclination to deal with this issue at the moment, yet it is one that needs to be addressed and acted on as soon as possible. Because the same radical Islamists who killed Ambassador Stevens have also desecrated the graves of British soldiers in Benghazi, attacked Mosques in Tripoli and made off with the remains of Sufi Saints and have threatened to do the same to American relics, it is imperative that the remains of the American sailors be exhumed and repatriated to safety as soon as possible. While the exact location of the graves should be kept from those radical extremists who would damage them if they knew where they were, the cemetery walls will not deter someone committed to desecrating them. 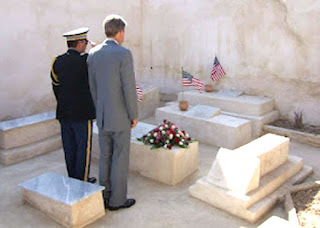 The Secretary of Defense, with the agreement of the Secretary of the Navy and with the approval of the Libyan authorities, should order the POW/MP Office responsible for the repatriation of the remains of American servicemen abroad, to send a team to Tripoli to secure and retrieve the remains in the Intrepid graves at the cemetery. They should be taken to a military forensics lab to see if they can be positively identified as any of the officers or seamen of the Intrepid and then given a proper burial with full military honors. The original purpose of maintaining the graves in Tripoli – to develop a working relationship with the Libyan government and secure the grave stones as a memorial, has been accomplished, the cemetery has been restored and its history documented. Now that the clearly identified graves of the Americans are seriously threatened by Islamic extremists, it is imperative that the remains in the crypts should be exhumed, examined, identified and properly reburied by Americans, rather than exhumed and desecrated by the radical Islamic extremists, if they haven’t done so already. From: William E. Kelly, Jr.
As you have honored them yourself while visiting Tripoli, you are familiar with the graves of the men of the USS Intrepid at Old Protestant Cemetery. Thanks to the efforts of the American government and military in Tripoli, the previously neglected graves of these American heroes have been restored and can remain a memorial monument to America’s stake in the new Tripoli. It is not secure however, and because of the desecration of the graves of British veterans in Benghazi, the assassination of the Ambassador Stevens and the theft of the remains of Sufi Muslim saints in Tripoli, there is a serious threat from radical fundamental Islamists who will desecrate and destroy the American graves if they could. The officers and men of the Intrepid died for the same ideals that Ambassador Stevens and Americans soldiers and sailors fight and die for today, so they should be treated with the same honor and respect. The Gadhafi government and former US Ambassador to Libya Gene Cretz had previously reached an agreement to permit the exhumation and repatriation of these remains and the new government should not oppose the move today. So with their approval, the POW/MP Office should be ordered to take the necessary measures to quietly exhume the remains of all Americans from the graves at Old Protestant Cemetery and deliver them to an official US military forensic laboratory to determine if they can be positively identified as any of the officers and men of the Intrepid. They should then properly reburied with full military honors. This is a mission that the POW/MP Office can and should be able to do quickly, secretly and efficiently. At a time when America is under attack and the US military could use some positive public relations, the emergency repatriation of the American heroes from Tripoli and their reburial at home with full military honors will shine a brief but positive spotlight on America and the US military, refresh memories of our mutual history with Libya, and reaffirm our commitment to the ideals Americans die for in foreign lands.